In this article I will explain how to use Subill, a subscription billing platform for automating SaaS billing. Subill is designed to be the billing engine enabling businesses to sell software as a service. Subscribe — A new customer signs up for your service. Trial Expiration — The free trial period expires and the customer is billed or access is restricted to the app. Upgrade/Downgrade — The customer changes their subscription to a differently priced tier of service. For example, upgrading to premium Netflix for access to ultra HD video at a higher price. Cancellation — The customer cancels their subscription. Resubscribe — A former customer returns to your service. Self-Service Portal — A self-service portal where your customers can view and download all their invoices, add or update their credit card, upgrade/downgrade/cancel their subscriptions, approve charges etc. The ability to set an application to react to these events (for example, restricting access if a free trial expires without a payment source), is the core to billing management for SaaS. Subill is designed with this in mind and gives a company the ability to add business logic around these events. Subill powers SaaS billing with two main constructs. 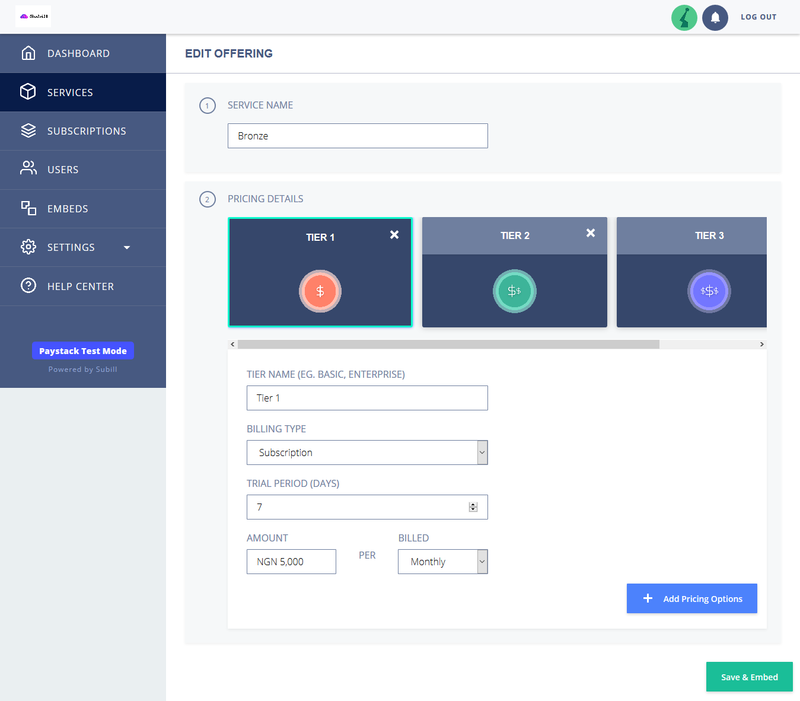 The Service Template, containing the details of what customers are subscribing to, and the Service Instance, which represents the service a customer has subscribed to. The Pricing tiers is needed to create different pricing tiers of the service Template. The Service Template is the blueprint needed to deliver an application to a customer. The template contains details such as the pricing and field definitions the end customer needs to fill out. For example, a business may want to collect a phone number or other information when on-boarding new customers. Their service template would contain a required input field that needs to be filled out in order to create a new service instance. Once a customer subscribes, a service instance is created based on the service template and the information they filled out. For SaaS billing, hooking into the lifecycle of the service instance is key. 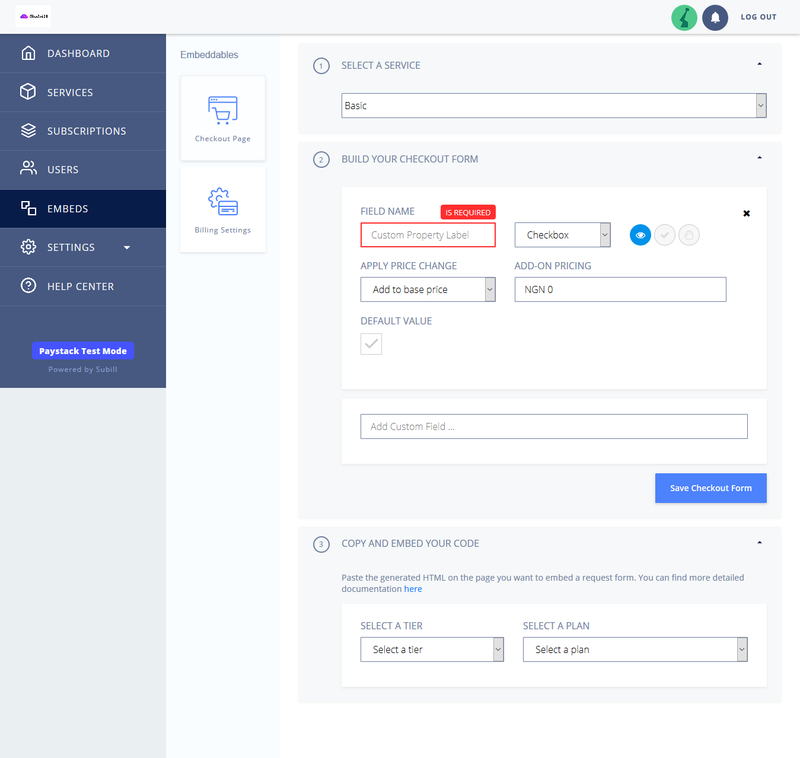 Instances can be upgraded, cancelled, or trialing — meaning all a company needs to do to implement billing is integrate their application with the different events that occur within Subill. Upgrade / Downgrade capability — If a SaaS offering has different pricing tiers, modifying the tier will change the price and apply proper proration. Cancellation — Cancellation of a service instance should stop all subscriptions as well as restrict access in the SaaS. Custom Charges — If a SaaS offers professional services, or various one-time charges, a service instance can have charges applied to it and be paid automatically. Free trials — With free trials being one of the best ways to sell a product, service instances support the ability to offer a trial service, as well as the power to credit users with extra trial time. Metered/Usage billing is a pricing model in which the customer is charged based on their actual usage of a product or service. With Subill, you can charge your customers a standard subscription fee for a plan with a set usage limit. Should a customer use more than what the base plan allows, metered billing charges them an appropriate per-unit fee for any overage. The other embeddable which Subill provides is an account management form. When you embed this in your SaaS, your customers can add their credit card, change their plan to a different tier, view all their invoices, cancel their subscription, or resubscribe. You just have to paste pre-generated code into your application and Subill takes care of the rest. One of the best ways to alert your app to billing changes, such as a trial expiring, is with webhooks. Webhooks allow apps to communicate real-time information to other apps. In this case, Subill would be providing your SaaS with billing information. 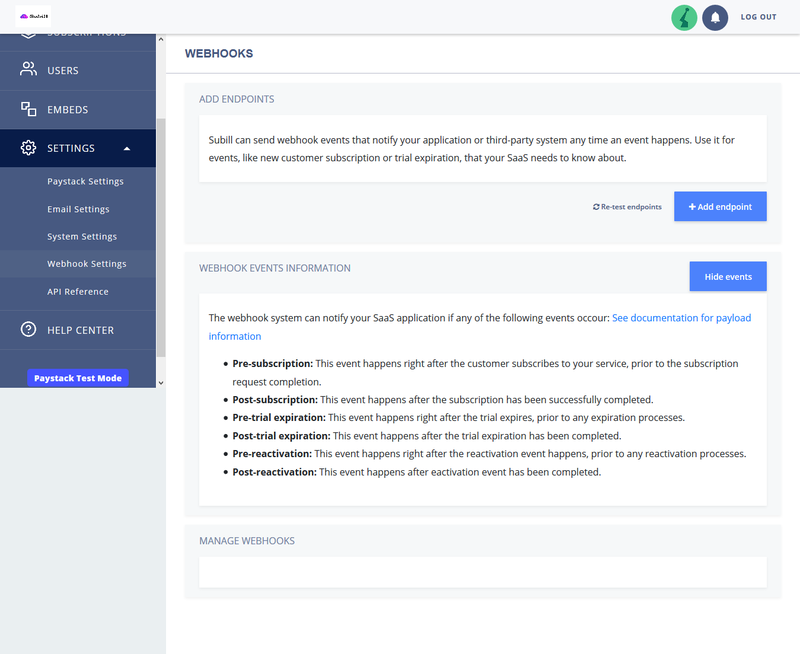 Using Subill, webhook endpoints can be defined so whenever a billing event occurs, the endpoint will be notified and action can be taken. For example: if a trial expires, a webhook will be sent to the SaaS and the customer can be locked out of the software until they pay. We at Subill believe that the process of getting paid for your software should not be a difficult task. Subill is different by focusing on the service being provided, making it much easier to tap into the subscription lifecycle. Got to https://www.subill.co to get started.